This interest group will bring together faculty, staff, and students who conduct teaching, research, or Extension activities on human health and wellbeing, with the goal of providing a forum for sharing ideas and increasing collaboration. Participants may emanate from many disciplines including but not limited to anthropology, biology, chemistry, economics, food science, health promotion, kinesiology, nutrition, psychology, and sociology, as well as from teaching, research or Extension appointments. 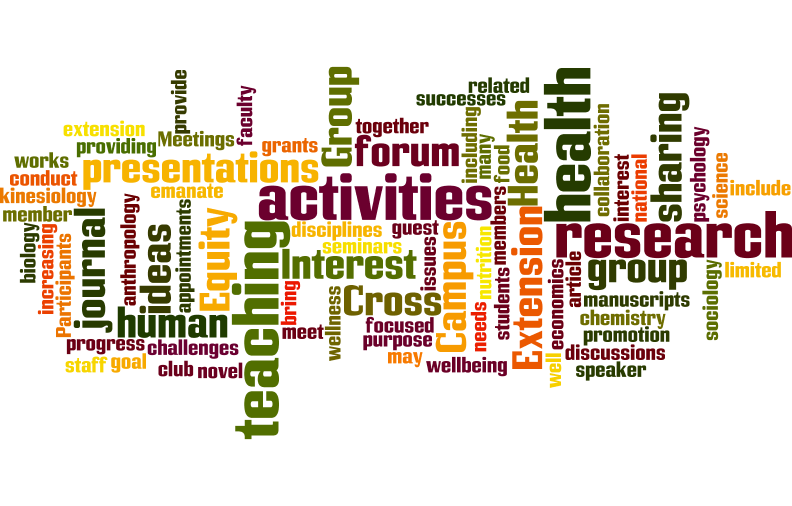 The purpose of the Health Equity Cross Campus Interest Group to provide a forum for sharing novel ideas, successes, and challenges on issues related to teaching, research or extension activities focused on human health and wellness. Meetings include journal article discussions (journal club), guest speaker seminars, member presentations of works in progress (manuscripts, national presentations, grants), other activities that meet the needs of the group members.